For many that was their debut saxophone public performance in a world record in front of 25,000 people! Other great comments Of the World Record Breakers that week. 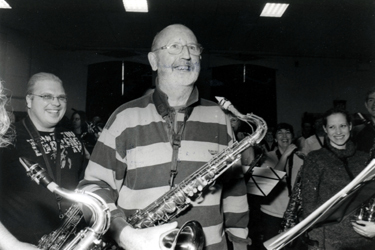 ‘After the dress rehearsal, as soon as I turned on the Radio 2 and there was Steve Wright saying Mr Mark Archer is going to break the World Record… and I was screaming with delight…then the next day I turned on the TV and there we were on HTV news..
Tom Holst our German Blowout Sax student. "awesome..it was thrilling to be part of this big big band.. the sound was resonating on your instrument at the same time, as it vibrate with the same sound...."
Luca De Matris Our Italian Blowout Saxman. “The best bit was meeting everyone who played the saxophone…I fell off the stage which was embarrassing but I wasn’t carrying my Sax, a friend was!!! "When Evan stuck his paper on me back. The wind blew up and the paper stuck to the side of my face! !...my bit of fame, where were you, there with a bit of A4 stuck to the side of your face trying to read the music." “It was nice to be part of something special.. the wind came up while we were playing so the music blew up so you couldn't see it!! That idea was mildly flawed. It was blowing up so much that the bloke in front of me just ripped it off and threw it on the floor." "There was a chap I met who works in Portishead, and he said I'm sure I recognise that woman. She works where I do. When he spoke to her, he found out she hadn't played for 20 years, saw this on the TV, got her sax out again and now wants lessons to play again." “It was fantastic to see the final result. We had a whale of a time. The crowd got really involved in it, clapping with the last piece of music, big cheers." " Listening to PeeWee was amazing. Really exciting playing for all those people who are screaming for you. Makes you want to play loads of things you weren't allowed 'cus of Guinness' world record rules." "What an adrenalin rush.. it felt like being Robbie Williams.. I thoroughly enjoyed being part of a group one family even though you didn't know half of them, one common cause.."
Julian Boswell Other feedback were via email:~ "Thank you for thinking up and organising The Big Blowout and for giving me the opportunity to take part in such an awesome experience. It was great and I had a fantastic time."